The mallet is made of wood in T-shape with a gross weight of about 800 grams (1 3/4 lbs). The total length of a mallet is 900 + 100 mm (35.4 + 4 in). The bottle-shaped mallet head is 215 + 5 mm (8.46 + 0.20 in). Its bottom is wrapped with a rubber cap which has an outer diameter of 66 + 2 mm (2.60 + 0.08 in), a total height of 38 + 1 mm (1.50 + 0.04 in) and a wall thickness of 5 mm (0.20 in). The base thickness of the rubber cap is 13 + 1 mm (0.51 + 0.04 in). The ball is spherical and made of natural wood with a diameter of 95 + 2 mm (3.74 + 0.08 in) and weight of 350 + 60 g (0.77 + 0.13 lb). 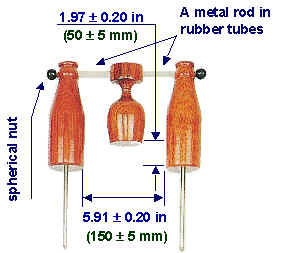 Most of the gate components are made of wood including two bottle-shape stumps, a glass-shape gate keeper, a metal rod, two spherical nuts, and two rubber tubes. The gate is formed with two wooden bottles as its stumps, which are fixed on the ground apart 150 + 5 mm in width, measured from the inner lateral of one stump to that of the other.